Bethor may join any Dark Angel command squad attached to a Master or Grandmaster. He replaces the standard bearer in the command squad. Brother Bethor can be re-assigned to any tactical, assault (without jumppacks) or deathwing squads (not deep striking) at the beginning of the game and counts as part of that squad for the rest of the game and cannot leave it. Bethor must always be given one of the three sacred standards at the additional cost indicated in the Dark Angels Armoury. Bethor with a sacred standard is an inspirational presence to the Dark Angels. The radius of effects of the Standard are increased to 12" as long as the units affected have a direct line of sight to the standard. Bearer of the Sacred Standards, Brother Bethor is an ancient warrior entrusted with bearing the most sacred items of the Dark Angels heritage. Wargear: Artificer armour, Powerfist, Boltpistol., frag grenades. 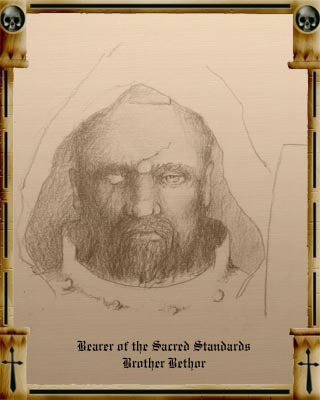 Brother Bethor sporting his facial injuries from the Cleansing of Durganion XIII, where his bravery won him the reward of being the Bearer of the Sacred Standard.